AFC Fylde kick-off pre-season training this weekend, and while striker Danny Rowe admits he isn’t looking forward to hours of running along the Lytham seafront, last season’s top scorer knows it is vital preparation. “Like anyone, it’s not a part of the season I particularly enjoy but I know I just have to get back now, work hard and get myself fit,” he said. “I don’t do much fitness work through the summer. I tend to find that having a rest during off-season suits me better personally. “It’s when pre-season starts that you really get back into it. “I don’t think any player enjoys the first few days of running but it’s not my first time, so you just know you have to do it. “It’s hard work initially and can be a bit boring, but there’s no point grumbling – it’s part and parcel of what we have to do as footballers. There has been a major reshuffle of the Coasters squad following the summer switch to full-time football and Rowe can’t wait to meet his new team-mates. “It gives us a chance to meet the new lads and start to gel as a team again,” he said. “It gives us time to get to know each other on and off the pitch, which is important. We can learn each other’s game. “I already know Willo (Steve Wiliams), from playing with and against him, and he’s a very a good defender. He is the kind of player you need in this league – big and strong. “I don’t know too much about Andy Bond but he has come from Crawley, so he is used to playing at a higher level and that can only benefit us. “I think the pick of the bunch is probably Brendon Daniels. He is a very good signing in my eyes. I was hoping we were going to sign him halfway through last season but it didn’t come off for whatever reason. “When we played Harrogate in November, Brendon was the stand-out performer on the night. I’d say he was the stand-out winger in the whole league last season. “A lot of the work we did ahead of the play-off games against Harrogate last season was on stopping him. I’m delighted he has come on board. “His delivery from wide positions is brilliant and he has a great left foot. 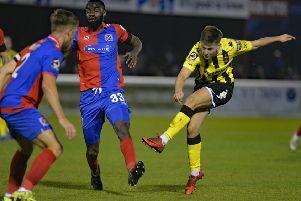 Rowe enjoyed a fine campaign, bagging 24 league goals before the Coasters missed out on promotion in the play-off final, and the frontman believes he can produce more of the same. “I scored quite a lot of goals and if I finish with a similar tally next season I’ll be happy – but I’d like to better it if I can. “I had a spell early in the season when I didn’t play much, so if I can get off to a better start I’d like to think I would better that total. National League North looks set to be at its toughest for many years but Rowe still believes that Fylde are the team to beat. He added: “We have lost some good players this summer, but we have brought some good players in and I’m sure there are more to come. “Last season I thought we were the team to beat – although Solihull Moors surprised everyone – and I think it will be the same again.